Please don’t be offended because I called Us Gentiles. I use the term to demonstrate the message of the Book of Daniel. God established a group of people known to us as Jews as his chosen people. All others were…Gentiles. As this is the fourth in a series on the book of Daniel I refer to us non-Jews as Gentiles. As I stated in my last post, the disobedience of Jews opened the door for Gentiles to receive salvation. Jesus Christ, Our Lord and Savior, ransomed us out of sin so that we too could have a right to the tree of life. It’s true that the Jewish people were disobedient. Look at what Ps. 78:10-11 (KJV) has to say. They kept not the covenant of God, and refused to walk in his law; And forgat his works, and his wonders that he had shewed them. (Psalm 78:10-11). 2. Repent of our sins. (Say you are sorry and really mean it). 3. Accept Jesus Christ as our only hope for salvation (Because He is). Yes, it is true that the Scripture in Matt. 11: 28-30 says that the yoke of Jesus is easy, but it never said that there was no yoke. It said that his burden is light, but it never said that there was no burden. Yes, it’s going to cost you something to be saved. It’s going to cost you your very life. But my, what a beautiful life you will gain when you put away your old life and take on the life of Christ. I hate to tell those of you who hate rules and only want to do things your way, but Jesus also requires that we follow His rules. We are told that when Jesus rules in the new Millennium (1000 year reign of Christ that follows the Tribulation) He rules with a rod of iron. Why call me Lord, Lord and do not the things I say? Jesus Christ is our perfect example of obedience. (Philippians 2:8) He was obedient to His father, even unto the grave. 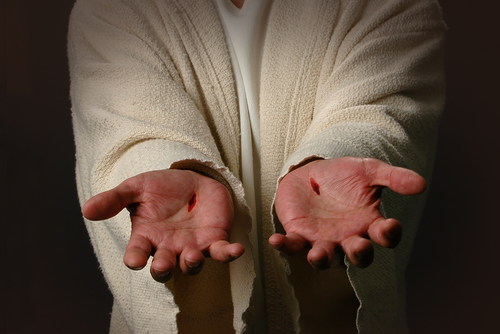 He hung, bled, and died for our sins, was resurrected and now sits at the right hand of His father. And for His obedience He is greatly rewarded. (Matthew 28:18) So, Jesus did all of this to keep us out of the Lake of Fire and you can’t say: Sorry; forgive me; fill me; I’ll live for you??? It all boils down to the same problem that the Jews had with obeying God and rejecting the Messiah. God has an answer for the Jews. The answer is the Tribulation. God knows how to deal with their disobedience and He will resolve the problem. They will receive the Messiah and become the evangelistic nation that they were always meant to be. Judah is an eternal people according to Joel 3:20. But what about you, dear Gentile? Will you give your heart to the Lord? Will you give up your way of sin and receive the Messiah? I implore you, “Get right, get right with God. The only way for you to get right with God is to receive Jesus Christ as your Lord and Savior. I’m going to live with Jesus forever and I want you to be there with me. Together we can give Jesus the glory that He so richly deserves. We will be able to add our voices to those who praise both God our Father and the Lamb of God, Jesus Christ, as described in Rev. 5:11-13. Next Don’t Let It Be Said, “Too Late”.